Looking for the perfect Father’s Day Gift? Or, this is a great offer if you do a lot of summer entertaining! 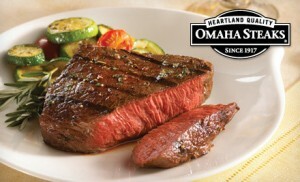 Up to 66% off Omaha Steaks Gourmet Meat Packages with Shipping. Three options available, starting at $55. Giveaway Bandit contains endorsements for products and services, which means when you click on a link that I recommend, I may receive a commission. Not every link is an affiliate link. « Win a 5-Day/4-Night Walt Disney World Resort Vacation!